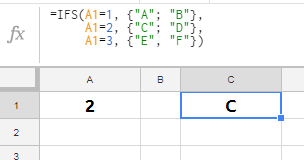 Is it possible to return a range from an IFS or SWITCH? 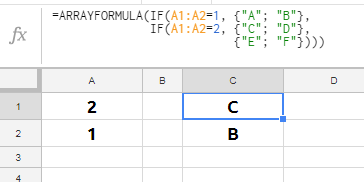 I am trying to simplify some 'if else if else' code by replacing it with a single IFS or SWITCH expressions. I have simplified all the code to be trivial but show the problem. The same issues happen when using SWITCH, with only the first value of a range being returned. Is there a good solution for these cases, or just keep using multiple IF expressions? 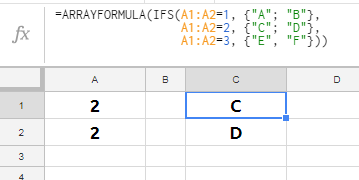 You may think that behaviour of IFS() is similar to IF() and reason of having IFS() is to avoid nesting of multiple IF() but that's not so true. Yes, there are some common baselines however, there is a major difference when it comes to arrays. 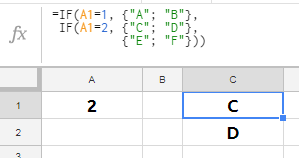 IFS() in a combination of arrayed output expects arrayed input - that's why you got returned single-cell output instead of arrayed output. Not the answer you're looking for? Browse other questions tagged google-sheets worksheet-function google-sheets-arrayformula or ask your own question.